Heat oven to 375°F. Heat oil in large skillet over medium-high heat until hot. Add onion, bell pepper and garlic; cook and stir 4 to 5 minutes or until tender. Add eggplant; cook and stir 2 to 3 minutes. Add tomatoes, beans, tomato paste, salt and oregano; mix well. Cook 5 to 10 minutes or until slightly thickened, stirring occasionally. Spoon mixture into mushroom caps; place in ungreased shallow baking dish. Sprinkle with cheese. Bake at 375°F. for 20 to 30 minutes or until mushrooms are tender. To serve, arrange spinach on individual serving plates; top each with filled mushroom. 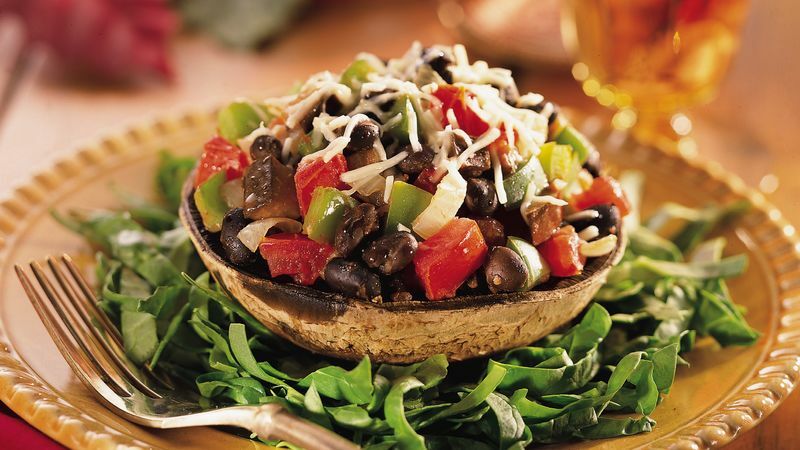 Drizzle each stuffed mushroom with a little balsamic vinegar and garnish it with sprigs of fresh oregano.